Spring is so close and it's got me excited for the next round of small goals for Feel Good Dress Better's small goals round up! (Feel Good Dress Better was formerly known as Writes Like A Girl.) 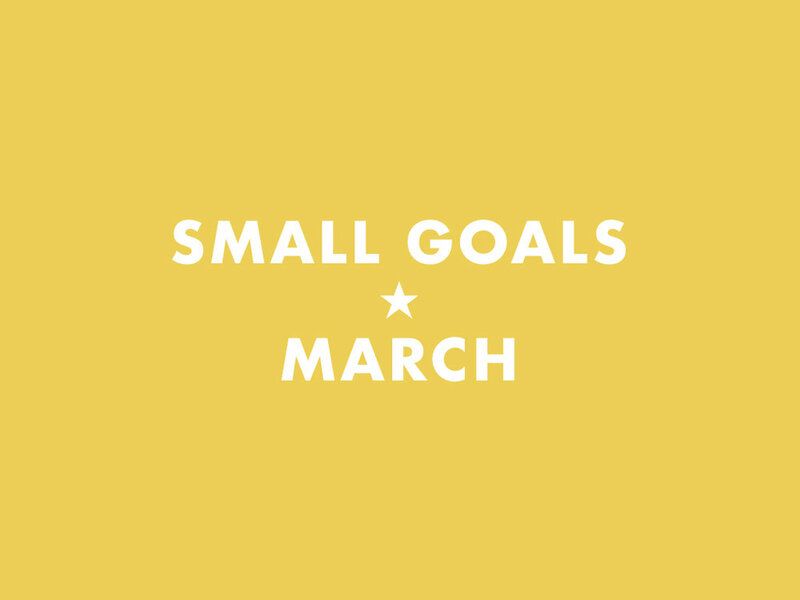 March represents my last month of being 24, and as I head toward the very exciting milestone of being 25, I'm definitely thinking about big goals, too. But for now, let's focus on small goals. Clean out my stationery collection and bookshelves. Done. I need to reship my stationery to my friend Irais-- they got returned to me due to a change in shipping rules so now I've gotta repack them at a post office. Send some nice letters to friends. Mission accomplished. I sent some letters to some buds for Valentine's Day. I didn't get to send all of them on time though and I really fell behind on correspondence. Hoping to catch back up in the coming months. I'm going to call this one a partial loss. I had good days and bad days on this. I want to have a really good month on this. I've done much better on this this month. I've not fallen into the pattern of just dumping things on my desk and I got rid of a lot of things I'd been avoiding dealing with. And now for this month's small goals! March is meditation and spring cleaning time for me. It's ramping up to my birthday and I'm also anticipating a move in June, so it's a great time to take stock and get rid of unnecessary things and make room for more wonderful blessings. Bring out my spring wardrobe and get rid of things that don't fit. As a yo-yoer-- and I mean that not literally, but as someone whose weight tends to fluctuate-- I have a constant struggle with my wardrobe in that I have clothes in a wide range of sizes, because the size I am changes all the time. I think I need to make space in my wardrobe for pieces that work better for my needs. I've gotta clear my skin up (and also take care of the rest of my body). That means I've gotta hydrate much better. I don't usually do a birthday goals thing, but turning 25 seems momentous enough that I oughta do something a little extra. What do I want to do at 25? I'm not sure yet. But I don't want to squander it. Put out some Philadelphia Flower Show content. I go every year and this year is no different. Follow along with me on Instagram @harperyi and stay tuned for photos and maybe even a video. Don't forget to join me and other fun bloggers at Feel Good Dress Better's small goals round up!